This elegant dining collection has the look of treasured antiques, but without the price. This collection features birch veneers carved into elaborate scrolls, turned arrow feet, and detailed dark metal ring pull hardware. The cherry brown finish is complemented by a beautiful tan arabesque design upholstery ornamenting the arm and side chairs. Whether you want to hide the good dishes away or display your china, this collection offers plenty of open display space and storage space in both the buffet and lovely server. 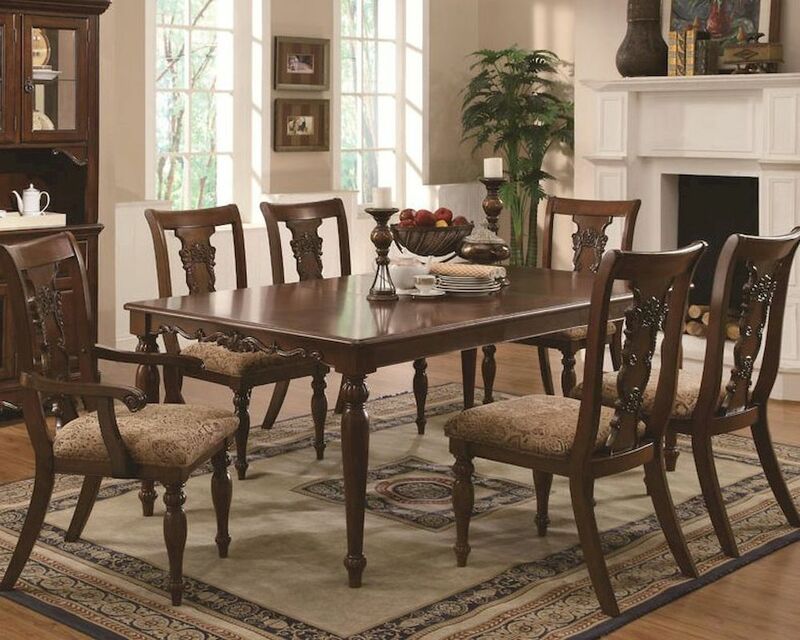 This beautiful traditional dining table is the perfect centerpiece for your dinner parties or family gatherings. The scroll and floral designs on the table were carved out of birch veneers and finished with a cherry colored polish. The table features a classic arrow foot design, a fancy flourish for your formal dining table. The arm and side chairs feature carved urn backs and arrow feet. Chairs complement the rich cherry finish with tan upholstery in an arabesque pattern. 1 x 18" Table Leaf Extends Table to 78"